Graded NM 7 by PSA. Hall of Famer, and a scarcer "High Number" entry. 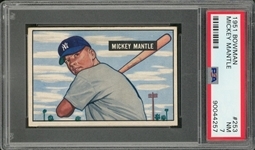 Bowman's number 253 in 1951, picturing the young Yankee outfielder Mickey Mantle (who would become an incredible ballplayer and an idol to millions of youngsters in the years to come), has become properly and firmly established as one of the most valuable and desirable of all baseball cards. Presented is a very satisfying representative of Mickey Mantle's "true" rookie card. In the inevitable comparison to its physically larger, double-printed rival, this sought-after piece is perpetually undervalued and famously condition-sensitive. This '51's color is vivid and clear, with exceptional registration for the issue. All four corners culminate in sharp points, and the back is boldly inked. 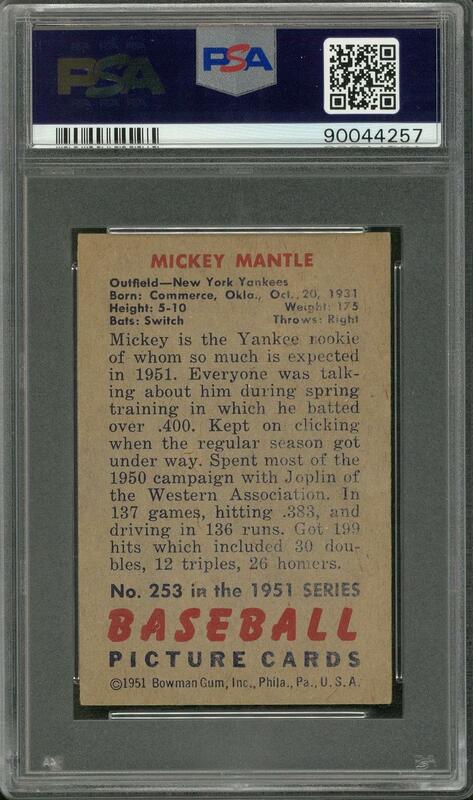 This is a bright, enticing copy of one of the 1950s era's most desirable baseball cards, in Near Mint condition.